Winner at Australian debut today, albeit in against fairly moderate horses. But, at least 6 off the lead at the 600m. Ran through the line like he was just getting warmed up. And the last 600m was run in 33.88, in a 1600m race. His final 600 and especially his last furlong would read much better. Godolphin may have found the perfect import to replace Hartnell. Very impressive Scamanda , agree with you there. Yep. Lightly races stakes winner and Gp 2 placed last prep in GB and could be a very serious contender here. Very much looking forward to our colleague Djebel's assessment of the horse, owners and trainer. Yep. Lightly races stakes winner and Gp 2 placed last prep in GB and could be a very serious contender here. Very much looking forward to our colleague Djebel's assessment of the horse, owners and trainer. Clearly the people at Godolphin who pick the Europeans to come here are good judges. I like James but he is the same as all Aussie trainers. Just wins the metrop if it goes there. 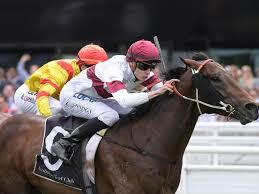 Group 3 Premiers Cup 1900m at Rosehill in 3 weeks, perhaps? Yes indeed. Well placed Lord Hybrow. In all sorts of trouble on the turn with Grimm actually showing some urgency. Once clear he was too good though. I will summon the soul of djebel here. If they give him a European style prep, he could win the cups. As it is if they run him every fortnight he will be cooked by the time things hot up in Melbourne. With the bump you were wrong twice. All his Euro racing was in France for the master trainer Andre Fabre. Metrop at his mercy now. Then off to the Caul Cup. James Cummings may not get the chance to choose his path , and I agree with your Metrop - CC plan being his best option. Lightly weighted surely. But I remember Hartnell had the Caul Cup at his mercy and Godolphin decided to run him in the Cox Plate against Winx. Why Metrop? Go to wfa in Melbourne, avoid any penalties and take an easy path to the CC. I'm looking at the likely weight for the Metrop. He'd have to get in light and it is a Group 1. In the WFA races he'd be facing some serious horseflesh. With no weight advantage. Have no idea what path they'll take, however he's won at Listed level and run three placings at Group 2 level in the NH including a 2nd to Cracksman who's been hailed by more than a few as the best horse in the world. Plotting a course to the Spring Cups is always tricky. Will be interesting to see where he runs next. I don’t mind the idea of the Newcastle Cup @ 2300m on the 14th Sept.
Then hopefully winning that sees his rating high enough to go straight into the Caulfield Cup @ 2400m on 20th Oct.
Has to rate 105+ now so what weight is that for Metrop? I don't know what rating he'd get, or what weight, or what race. But I will be following him. I'd love to see him in Melb actually, but only because Grimm Scholfield would stay in Sydney. Newcastle Cup looks the next best option into the group 1s. Why go through WFA when you can pick off the handicaps while you can. On this trajectory he'll be a WFA next season and will be weighted out of the winnable races now. Yes those races are why I think he'll come to Melbourne rather than Metrop or Newcastle. Haven't been as excited over a 2000m horse since Gingernuts !! However it's not often advisable, even as trainer, to second guess Godolphin.